Back to basic tip #27: Since I have two girls, we have a lot of dress up clothes and accessories. Most of them are small stuff – necklaces, clip-on earrings, princess shoes, hair accessories, wands, etc. I was tired of having all the dress up clothes get mixed in with the toys in the toy box. 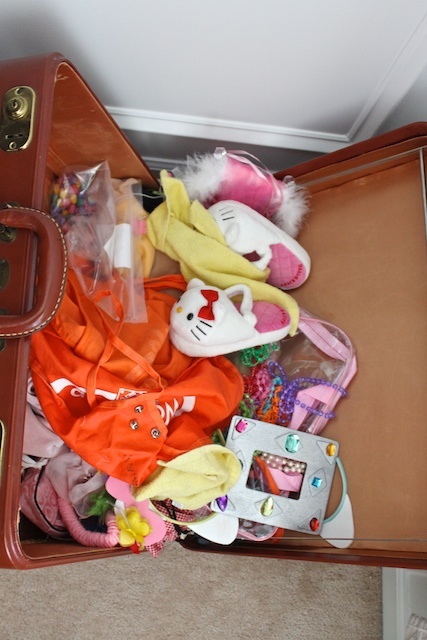 All the accessories are lost at the bottom of the toy box and the kids can’t ever find anything. 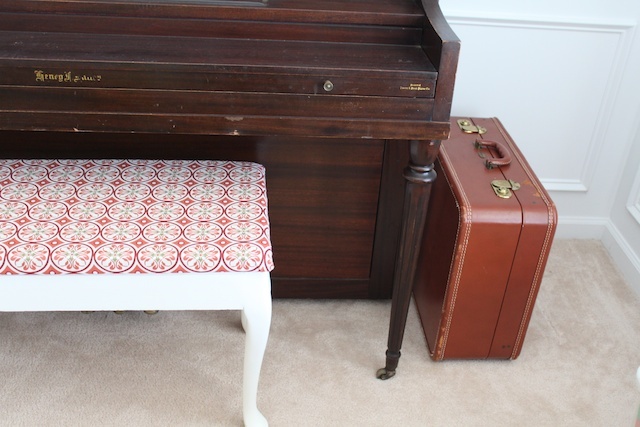 So I purchased an old suitcase that matched the playroom and placed all their dress up stuff in that suitcase. This keeps all their dress up stuff in one place and easy for them to find things. And when they are done, I close the suitcase and no one knows it’s there. This can work with any toys – Legos, train sets, Barbies, etc. Also check out this tip for organizing toys. » Tell me… How do you organize all your children’s little toy accessories? Yep, I did the exact same thing – neatly organize (i.e. shoved) all of the clothes into a cool suitcase I found at Goodwill. Works like a charm! How do I organize the little things? I don’t, which is why my playroom is a disaster! I try to keep them in designated baskets, but we all know what happens when a kid is looking for something in particular. Maybe this could help. Wow! That is the cleanest playroom I have ever seen! Your floor is immaculate. The second one roo in our home gets clean all the rest turn into disasters. I am so amazed.